This is an informal blog by the staff writers at Nova Analytical Systems. The intention is to talk about gas analyzers and issues related to manufacturing them. However, our interests are many and varied, so there will be numerous topics discussed. We are still amateurs at blogging. So if you see anything verbal or visual that is a copyright infringement, do not hesitate to notify us. We will correct any problems immediately. Thank you for visiting. I mentioned recently that Post #70, which was called “Post #5 is our most popular blog post (Syngas and Gasification)”, has itself now become our most popular post. I guess if you say something is popular, that proclamation alone is enough to pique some interest. Another reason for the popularity is probably because of its topic - syngas and gasification. Specifically, the analysis of syngas composition. In this application, the critical gases are H2 and CO. However, most of our gasification customers want analysis O2 / CO / CO2 / CH4 / H2. 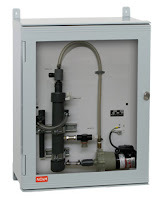 We can offer this combination of gases in any range in a single analyzer. Here’s one that we are building now to support a Fischer-Tropsch process in which H2 & CO are converted into hydrocarbons in the presence of a catalyst. Besides having a capable analyzer for this application, it is also important to condition the sample properly before analysis. Depending on the feedstock being used in the gasifier, the sample may have a significant amount of particulate in it. It is important to remove the particulate before condensation develops and mixes with the particulate. 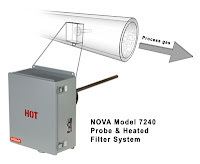 A heated filter that is mounted behind the probe at the extraction point is a good solution. A version of this filter can even be produced for high pressure samples or for Class 1 Division 2 Hazardous Rated Areas. Many of our customers have reported to us that if the feedstock is comprised of woodchips or other wood-based matter, there is a strong possibility of tar being in the sample gas. These tars may condense out onto various surfaces. Especially of concern are the optical surfaces of the detectors. 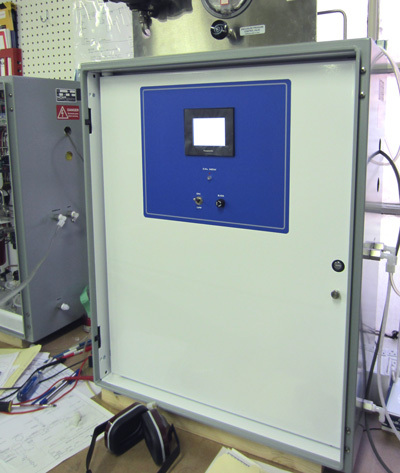 We have had some success in removing tars by integrating a gas cooler in a separate cabinet beside the analyzer. This encourages the condensable tars to accumulate on a non-critical surface away from the detectors. Ideally, the cooling assembly should be somewhat modular to allow easy access for cleaning or replacement. On some projects where the feedstock is municipal waste with high variability, we have noticed the presence of other gases besides just H2, CO, & hydrocarbons. For example, there may be SO2 or NH3 in the sample gas. These gases may be detrimental to the long-term operation of the analyzer, so it is frequently best to eliminate these gases from the sample. On some gasification projects, we have supplied water-wash systems to scrub out any corrosive gases that are water-soluble. Sometimes analysis of multiple points with one analyzer is required. 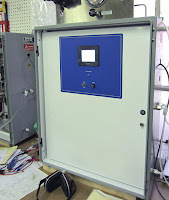 We have supplied an industrially-hardened version of our auto-sequencer for some gasification projects. This system will continually pull a sample from several sample points and send only one at a time to a single analyzer. The auto-sequencer will cycle through the sample points according to a user-defined schedule. Generally, the dwell time on each sample is a few minutes. Not sure if this post will become as popular as the other gasification-related posts. But we will try to continue providing updates on Nova solutions for this interesting application. For information on these and other gas analyzer systems, give Mike or Dave at Nova a call, or send us an e-mail. 2010 Nova Analytical Systems Inc. Simple theme. Powered by Blogger.